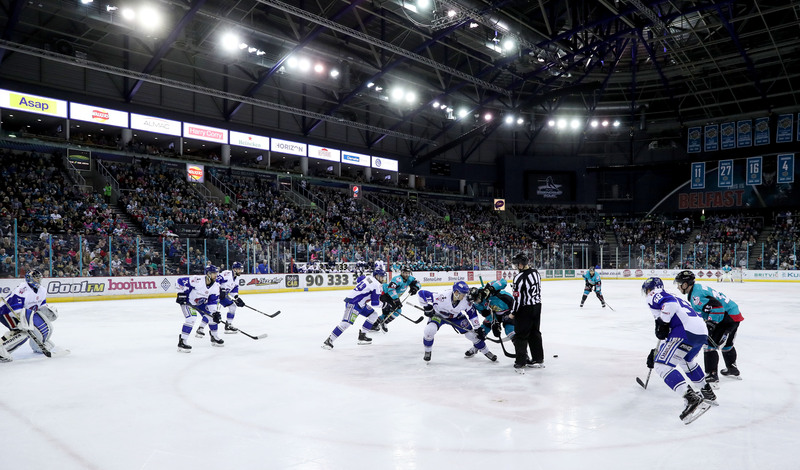 A virtual sell out was on hand to welcome the Elite Ice Hockey League Champions onto home ice for one final time in 2018/19. And what an ovation they received. 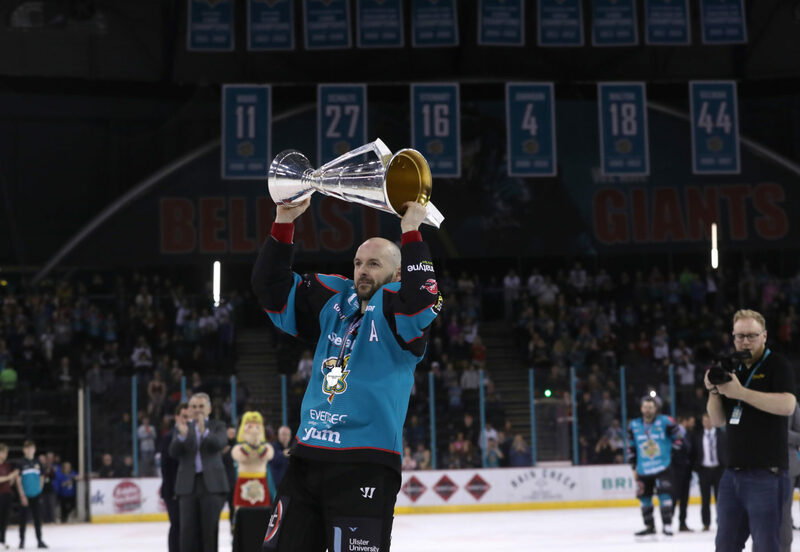 The latest addition to Adam Keefe’s silverware haul this year would be presented post game- but first, a Playoff Quarter Final 1st leg lay in store against the very team who defeated Cardiff last Sunday to send the title to Belfast- Danny Stewart’s Coventry Blaze. Before the game got underway, a touching minute’s applause was offered up to the victims and families of the Humboldt Broncos bus crash- exactly one year ago to the day. There was also a deserved moment of recognition for long time Blaze equipment manager Steve Small, who was acknowledged on-ice to loud applause by Belfast’s very own Jason ‘Taff’ Ellery. When the action finally got underway, it was cagey. Belfast perhaps the most threatening of the two sides in the first ten minutes- applying their now signature fore check and high press to put pucks on Blaze goaltender Matt Hackett. At 10:58, Darcy Murphy hovered behind Matt Hackett’s net, before laying the puck up to Kevin Raine at the point. Raine unleashed a one timer as Murphy moved out front to deftly tip it down and into the net. Kendall McFaull took the night’s first penalty, sitting for slashing at 14.34 which was killed without incident. McFaull had just rejoined the action when Alex Nikiforuk sent Belfast onto a power play of their own with a hooking call. As has been the case all year, Belfast’s pressure was good- including a heart stopping moment when Blair Riley rang the iron. However both sides closed the period out at even strength. 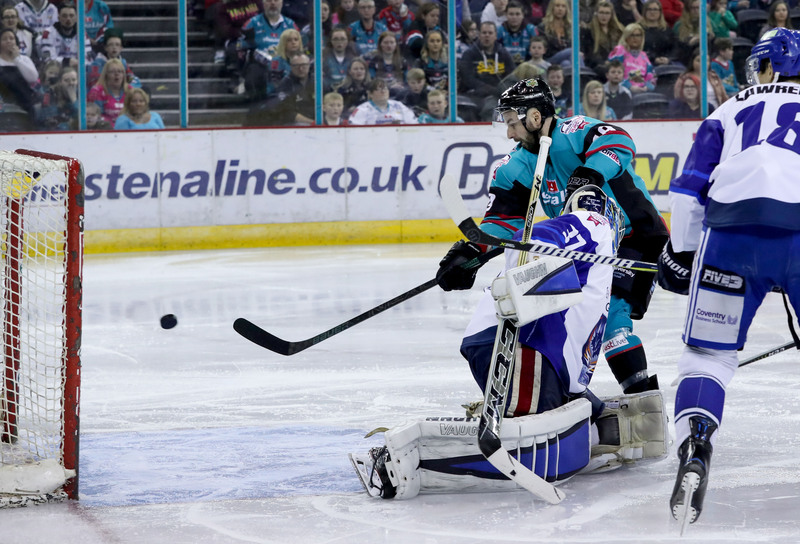 The Giants continued to press hard in the Blaze zone, peppering the D lines and Hackett with a succession of chances. By the midway point of the game, Belfast had rang the iron three times. Kevin Noble headed to the box for hooking at 29.25, earning himself a healthy chorus of boos in the process. 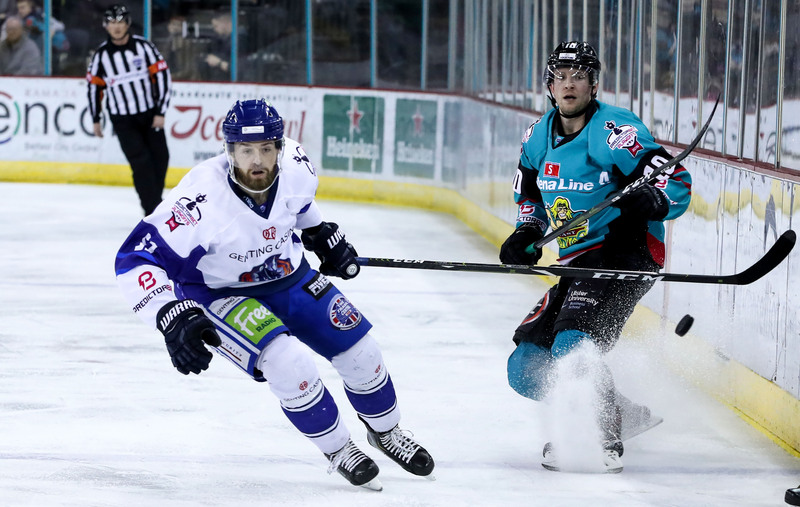 The same Chris Higgins continued an eventful period by sitting for two minutes for interference as the period approached its final five- a penalty the Giants very solid kill unit took care of. Coventry would close out the period on the power play courtesy of a Josh Roach tripping call at 39.08. In fact, Tyler Beskorowany had to shut the five hole to prevent a Coventry marker during the delayed call. 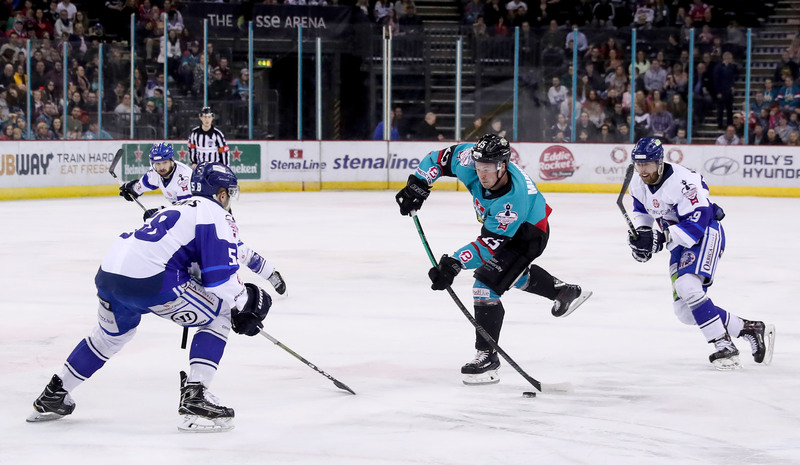 The Belfast Giants opened their final period of home hockey for 2018/19 by killing off the power play. The sides traded power plays as the action reached its final ten minutes, but the score remained locked at 4-0 with Coventry unable to break their goose egg. A slash between Patrick Dwyer and Nicolai Bryhnisveen shortly after (2 mins each) drew Matt Hackett out of his crease (2 mins leaving the crease) and into the fray. Sharp words were exchanged between Hackett and a number of Giants, most notably Blair Riley, as the red hot capacity crowd let the Blaze goaltender know what they thought of him. 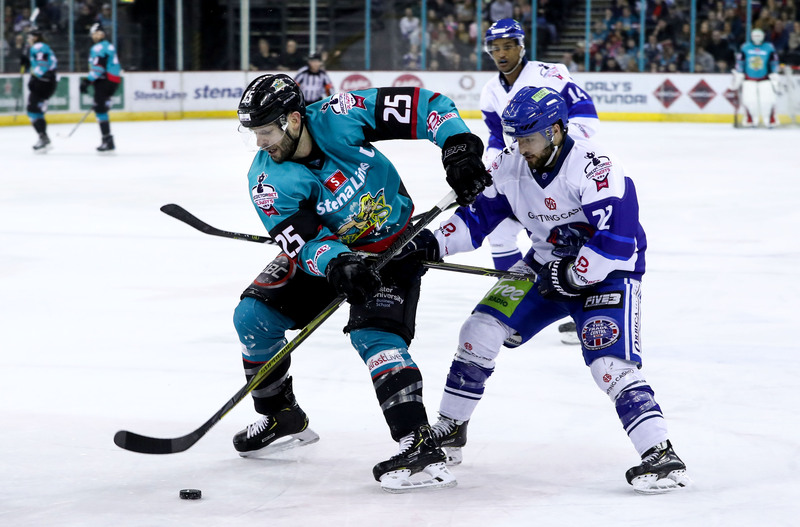 The Coventry Blaze offered little else in the way of meaningful attack, and the Belfast Giants brought a momentous season at home to a close with a 5-0 shutout win. 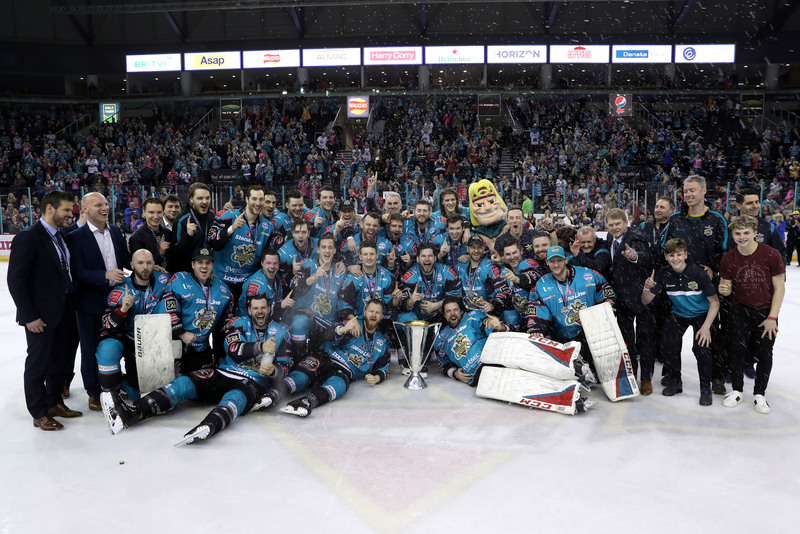 Following the game, the brand new Elite League Championship trophy was presented on ice, in a home farewell which will live long in the memory of the Teal Army, and go down in history as one of the greatest of all time. What we have watched this year has been truly special. And the best part?